Each season has its own impact on home sales, and winter is no exception. Winter has long been saddled as the worst time of year to sell a home, as fewer buyers are out looking. But new research from Redfin suggests that often, winter is a great time to sell. Of course, sales are more dependent on individual market than any other factor. But how can selling your home during the winter versus spring affect your home’s sale? Winter buyers are often in different circumstances than warm weather buyers. Buyers may be braving the elements due to a change in circumstances, such as transferring locations for a job or a change in family dynamics. These circumstantial buyers are looking for a home that best meets their needs, and want to close on it as quickly as possibly, as opposed to the window-shopping buyers you may see in warmer weather. Selling in winter has benefits for sellers. Less effort and finances can be put into curb appeal and landscaping, as simply maintaining the home’s exterior and raking leaves is required for a neat appearance. As the Redfin study revealed, homes listed in winter sold one week faster and for 1.2% above listing price than similar homes listed in other seasons. Be careful to avoid winter pitfalls. If you have showings on cloudy days, make sure to turn on lights and lamps to brighten up your home. Have seasonally appropriate scents, like cinnamon, peppermint, or vanilla, wafting through your home. Drape a plush blanket across an armchair, or stack firewood near the fireplace. Play up to the cozy factor to counteract any gloominess that winter could impose on your home. The Terrell Team can help guide you through the home selling process any time of year. Our agents can give you an up-to-date market analysis, helping you decide to list now or wait out winter and sell in the spring. Once your home has sold, we can also help you find the next place to call home. 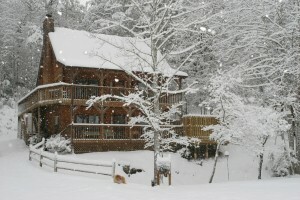 We have listings in Sevierville, Gatlinburg, and Pigeon Forge. From a cozy cabin to distressed homes, there’s something for everyone in the Smoky Mountains.